Rejuvenating or enhancing the face and body often involves improving the overall shape or fullness of an area, and Sculptra treatments can provide predictable results without surgery. Starting in our 20's we start losing fat and eventually bone from areas of the face at different rates, leading to jowling, sagging, deepening lines, thinning of the lips, downward displacement of the nose, lengthening of the distance between the nose and the upper lip and less forward projection of the chin and cheeks. Could it be any more depressing? Why, yes--because some of the skin that's no longer held up and out by the facial frame ends up under the chin. Sculptra®, which stimulates the skin to thicken and lift, is an excellent choice for those who would benefit from adding a few millimeters of thickening to an area rather than just filling in a line or wrinkle. 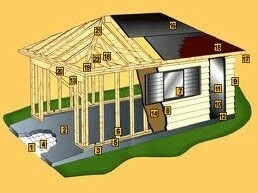 It can restore the frame of the face much like putting in the foundation before you build the rest of a house. Sculptra® can mimic the appearance of bone as well as fat, and it builds up slowly over several treatments done at least a month apart. The results essentially replace the frame of the facial canvas, and once the frame is achieved, much like the foundation of a house, you can fill any remaining surface wrinkles or depressions with dermal fillers. Sculptra is most often used to provide facial volume but we also find it effective for improving decolletage lines, knee wrinkles (kninkles), and even buttock enhancement. Unlike injectable fillers like Juvederm® or Radiesse®, which produce an immediate result when injected, Sculptra® works slowly by stimulating the buildup of the body's natural collagen to thicken the skin. The main ingredient of Sculptra® is poly-L-lactic acid, derived from fruit acids, and it has safely been used in surgery for more than 25 years. The improvement from Sculptra® treatments is gradual, so others won’t notice a sudden difference, and the results can last two to three years. 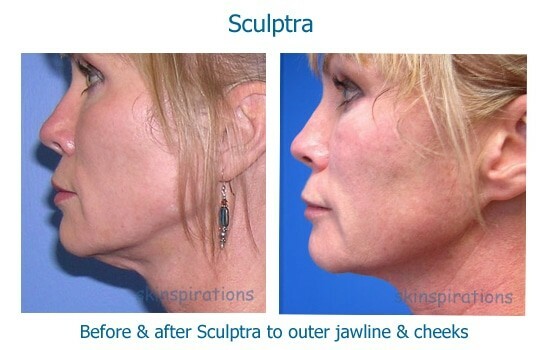 Sculptra treatments are usually done in a series to reach desired results, with amounts needed varying widely, depending on the treatment area size and the degree of improvement desired. For people with moderate facial volume loss, an average of two to four treatment sessions, using two vials of Sculptra per session, are needed to get significant improvement. For Sculptra treatments to the body, the average amount ranges from one to three sessions for the decolletage and knees, to three to infinity sessions for buttock augmentation. The area treated usually starts to begin filling out about four to six weeks after the first session and the results continue to improve over the following months. Usually one to two treatments done each year will maintain the improvement seen with Sculptra®. The fee for a treatment with 2 vials of Sculptra is $1,445, and $850 for onve vial. Sculptra needs to be prepared 2 days before a treatment, so it usually isn't possible to do the treatment on the same day as a consultation. Call 727-571-1923 now for a complimentary consultation to learn more about the best treatment options for your appearance goals.